Upbeat Piano Studio Director Melanie Dickson-Smith has been teaching piano and theory lessons in the Greater Toronto Area since 1989 and she has been teaching in the Toronto community of Leaside and the surrounding area since 2004. She is known for her enthusiasm and keen interest in each student’s musical development. This year, the studio is expanding to offer even more services. There are new group theory classes and new teachers to accommodate even more students. 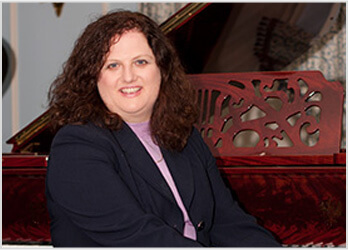 Melanie began teaching piano in Leamington, Ontario in 1981 while an advanced piano student. She studied piano with Marion Stuart-Kosmala, M. Mus., B. Mus., A. Mus. (all in Piano Performance) in the 1980s and with Bill Keis, jazz/contemporary pianist, keyboardist, composer, producer, musical director, educator, and author of 488-page book “The Complete Guide To Learning Music” in the 1990s. She also studied theatre at York University and acting at the Banff School of Fine Arts and performed as an actor and singer in community, university and other non-equity theatre productions. She studied pedagogy with James Lawless, ARCT (Piano Performance), LRCT (Piano Licentiate, U of T), Chief Examiner Emeritus, Royal Conservatory of Music. Melanie has successfully completed the certificate program requirements for Intermediate Piano Pedagogy towards the A.R.C.T. Diploma in Piano Pedagogy from the Royal Conservatory of Music. She has also attended many seminars and workshops presented by senior teachers and examiners in North America, to keep abreast of the latest innovations in teaching and learning music. She has had many student candidates succeed at RCM practical and theory examinations. Why Do Music Students Quit?